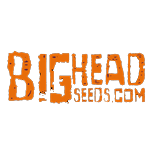 Big Head Seeds - Granddaddy Purple. Free US delivery. The buzz around this plant introduced in 2003 felt like a real game changer, a coming of age for true global recognition for breeders of excellence. Beautifully oversized crystal encrusted purple flowers with a heady grape aroma and freshly picked berry taste. The effects of this are instant hitting the mind and body with a wonderful euphoria and the deep relaxation of every cell in your body. Get yourself comfortable and chill in a blissful timebending reality of your own. An absolute doddle to grow indoors or out.